At Firstronic, we are proud to say we are First in Quality, First in Service. Our customers and the industry apparently feel the same way. Over the last three years, we’ve received awards for a broad range of accomplishments including our ability to support quickturn project start-up, customer satisfaction, operational performance, revenue growth, leadership in the contract manufacturing industry and even our ability to create U.S. jobs. Firstronic won the Dependability/Timely Delivery category in the 2019 Service Excellence Awards (SEAs) for Electronics Manufacturing Services (EMS) providers with revenues of $101 million to $500 million. Firstronic won the Responsiveness category in the 2019 Service Excellence Awards (SEAs) for Electronics Manufacturing Services (EMS) providers with revenues of $101 million to $500 million. Firstronic won the Value category in the 2019 Service Excellence Awards (SEAs) for Electronics Manufacturing Services (EMS) providers with revenues of $101 million to $500 million. Firstronic won the Technology category in the 2019 Service Excellence Awards (SEAs) for Electronics Manufacturing Services (EMS) providers with revenues of $101 million to $500 million. Firstronic won the award for Technology at the 2018 Service Excellence Awards (SEA) for Electronics Manufacturing Services (EMS) providers with revenues of $101 million to $500 million. Firstronic won the award for Manufacturing Quality at the 2018 Service Excellence Awards (SEA) for Electronics Manufacturing Services (EMS) providers with revenues of $101 million to $500 million. Firstronic won the award for Value for Price at the 2018 Service Excellence Awards (SEA) for Electronics Manufacturing Services (EMS) providers with revenues of $101 million to $500 million. Firstronic won the award for Dependability/Timely Delivery at the 2018 Service Excellence Awards (SEA) for Electronics Manufacturing Services (EMS) providers with rev enues of $101 million to $500 million. Firstronic won the award for Dependability/Timely Delivery at the 2018 Service Excellence Awards (SEA) for Electronics Manufacturing Services (EMS) providers with revenues of $101 million to $500 million. America’s fastest growing mid-tier EMS is taking risks and reaping the rewards. 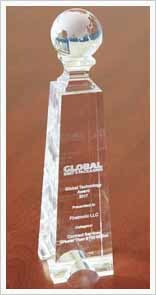 Firstronic won the 2017 Global Technology Award in the category of Contract Services greater than $100 million. 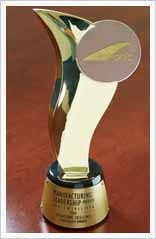 For the second year in a row,Firstronic has been recognized by Frost & Sullivan Manufacturing Leadership (ML) Council. 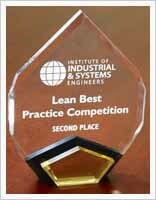 Firstronic took second place in the Institute of Industrial & Systems Engineers (IISE)’s Lean Best Practice Award 2017. 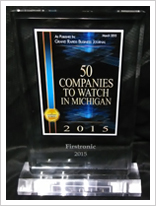 Firstronic was recognized by the Michigan Economic Development Corporation (MEDC) as the Most Strategically Focused of the 600 alumni making the Michigan 50 Companies to Watch list over the last 12 years. 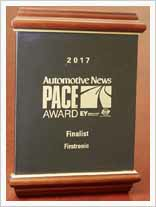 Firstronic was named a Finalist for the 2017 Premier Automotive Suppliers' Contribution to Excellence (PACE) award, sponsored by EY, Automotive News and the Original Equipment Suppliers Association. Firstronic won the award for Dependability/Timely Delivery at the 2017 Service Excellence Awards (SEA) for Electronics Manufacturing Services (EMS) providers with revenues of $101 million to $500 million. Firstronic won the award for Technology at the 2017 Service Excellence Awards (SEA) for Electronics Manufacturing Services (EMS) providers with revenues of $101 million to $500 million. 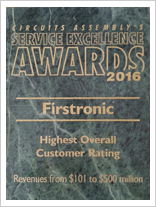 Firstronic won the award for Responsiveness at the 2017 Service Excellence Awards (SEA) for Electronics Manufacturing Services (EMS) providers with revenues of $101 million to $500 million. Firstronic won the award for Value for Price at the 2017 Service Excellence Awards (SEA) for Electronics Manufacturing Services (EMS) providers with revenues of $101 million to $500 million. Firstronic’s Grand Rapids, Michigan facility has been named a 2016 IndustryWeek Best Plant. Firstronic received significant recognition at the Kongsberg Automotive (KA) Supplier Awards/Mentor Dinner Conference, winning the Gold Award for Customer Satisfaction. Firstronic received significant recognition at the Kongsberg Automotive (KA) Supplier Awards/Mentor Dinner Conference, winning the Corporate Responsibility Award. 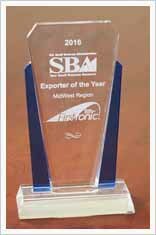 Firstronic was awarded the U.S. Small Business Administration’s (SBA) 2016 Exporter of the Year award for the Midwest Region, on May 5th at the Twelfth Annual Michigan Celebrates Small Business awards dinner. 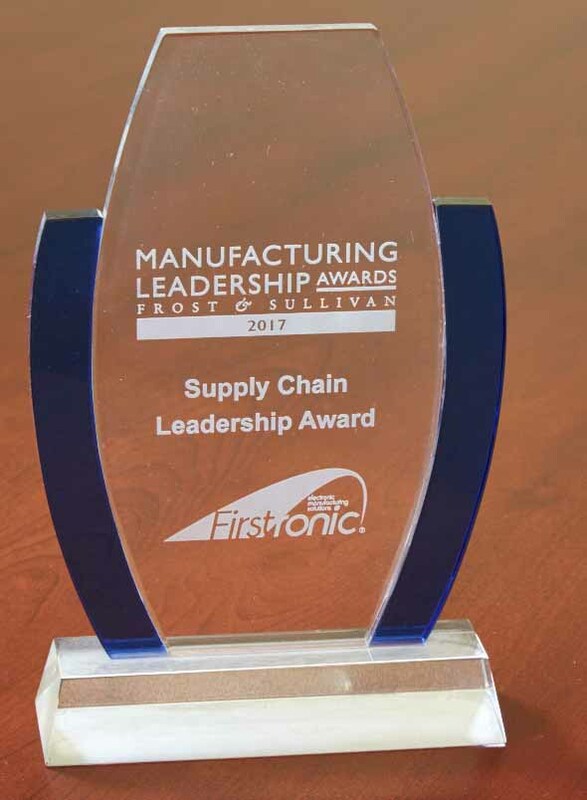 Firstronic was recognized by Frost & Sullivan's Manufacturing Leadership (ML) Council as a winner of the Operational Excellence Leadership Award at their 2016 Manufacturing Leadership Award Gala held on June 6 in Carlsbad, CA. 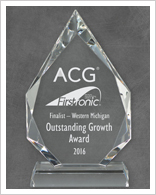 Firstronic was named a finalist for the Association for Corporate Growth (ACG) Western Michigan Chapter’s 2016 Outstanding Corporate Growth Award. Inc. magazine ranked Firstronic No. 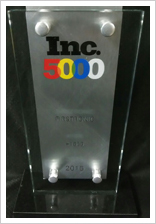 1504 on its 35th annual Inc. 5000, an exclusive ranking of the nation's fastest-growing private companies. Firstronic won the 2016 Plex Impact Award for Leadership at PowerPlex 2016. 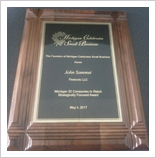 Firstronic LLC Named as a 2015 winner of the Michigan 50 Companies to Watch award and honored at the eleventh annual Michigan Celebrates Small Business event. Inc. magazine ranked Firstronic No. 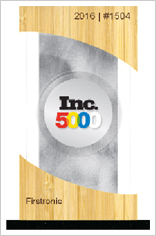 1685 on its 34th annual Inc. 5000 an exclusive ranking of the nation's fastest-growing private companies. 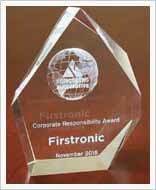 Firstronic was recently named a winner in Corporate America’s Software & Technology Awards 2015 winning the award for Best Contract Electronic Manufacturer - USA and Recognised Leader in Reshoring Solutions - USA. 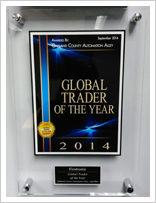 Firstronic LLC was named Global Trader of the Year at the 14th annual Automation Alley Awards Gala held on Sept. 12th at the MotorCity Casino Hotel in Detroit. 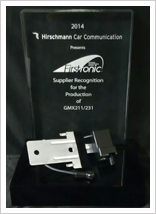 Firstronic received a Supplier Recognition Award for its performance on production of the GMX211/231 unit.